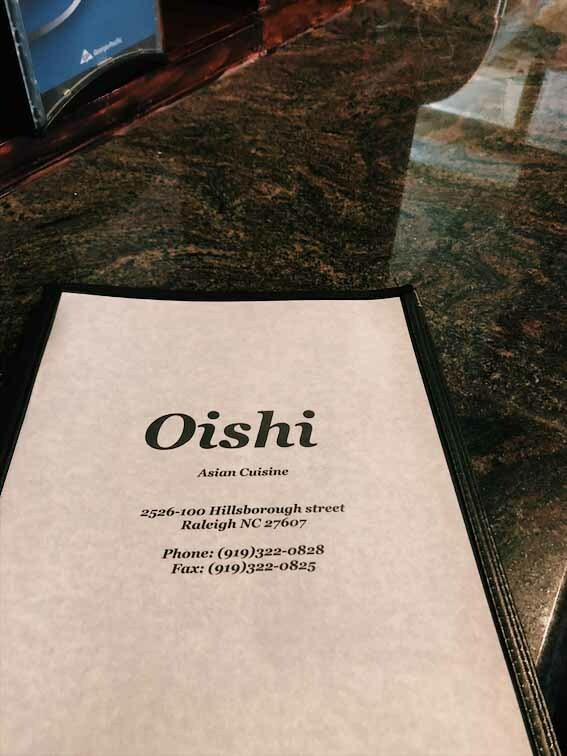 This week for Tasty Tuesday, we went to Oishi, a Japanese cuisine staple of Hillsborough Street. At first glance, it may not look like the restaurant can accommodate more than a handful of customers in the front dining room. The host, however, seated me without any wait time and guided me through a back hallway that led to a dining room bursting with the Raleigh lunch crowd. I sat at a bar table right in front of the kitchen, getting a front row seat to the chefs hard at work. It was a fast paced and exciting environment where families had stopped in, college kids were hanging out between classes and others were out to lunch with colleagues. The menu offers a wide variety of Asian cuisine options, including Hibachi, Shrimp Tempura and an impressive selection of specialty Sushi rolls. Oishi also has several specials, including their always-changing “Daily Lunch Special” for $5.99 and their “Daily Dinner Special” for $8.99. Both options come with an iced tea. I decided to order the “Daily Lunch Sushi Special” option, picking two specialty sushi rolls with a regular iced tea for only $7.99. 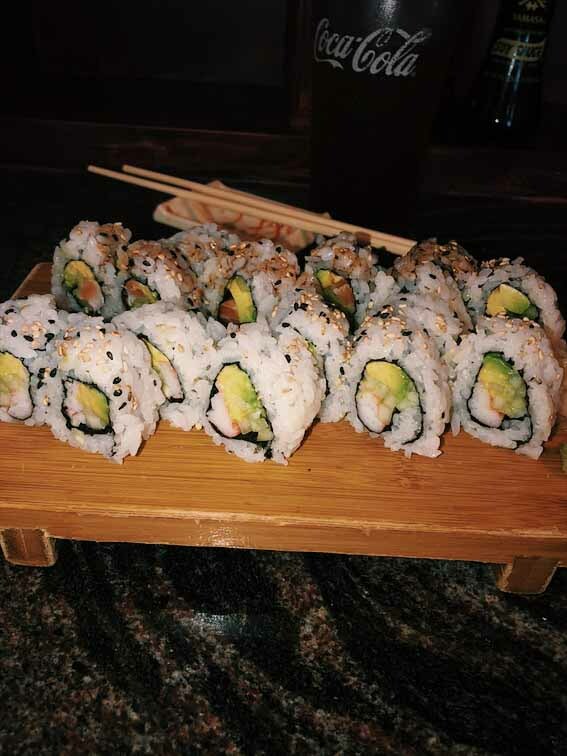 Sweet and flavorful like the Avocado and Caterpillar rolls or wild and spicy like the Firecracker and Dynamite rolls, the sushi selection at Oishi has something for everyone. I ordered on the milder side, choosing the Alaskan and California rolls as my lunch duo. The Alaskan roll was wrapped salmon with cucumber and avocado, topped with a sweet sauce. 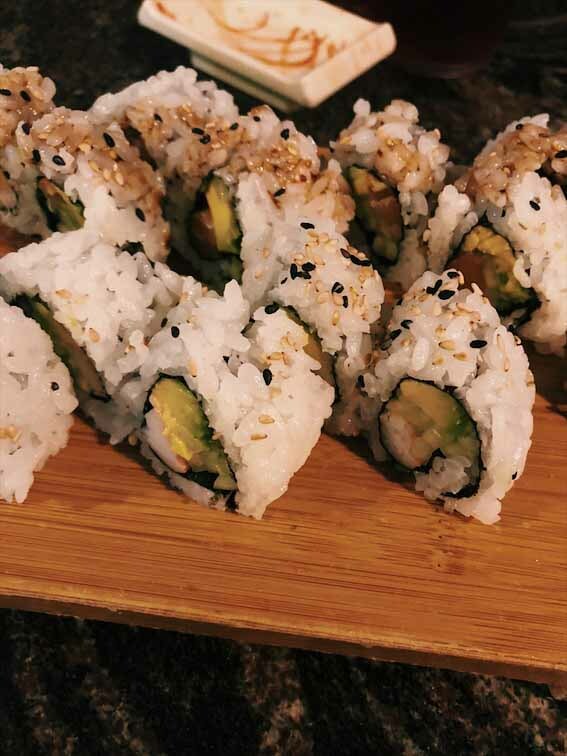 The California roll featured crab and the same cucumber and avocado pairing. Both of these rolls were the perfect combination of flavors and I would order both of them again! The sushi was crafted to perfection and beautifully presented on a wood-style platter. The sweet sauce on the Alaskan was definitely a stand out favorite for me. I cannot wait to go back soon and work my way through some of the more daring menu options. Maybe the deep fried Bagel Roll with salmon, cream cheese and a spicy sauce, or perhaps the eye catching Rainbow Roll with crab, cucumber and avocado, rolled with salmon, white fish and tuna. The combinations are endless!